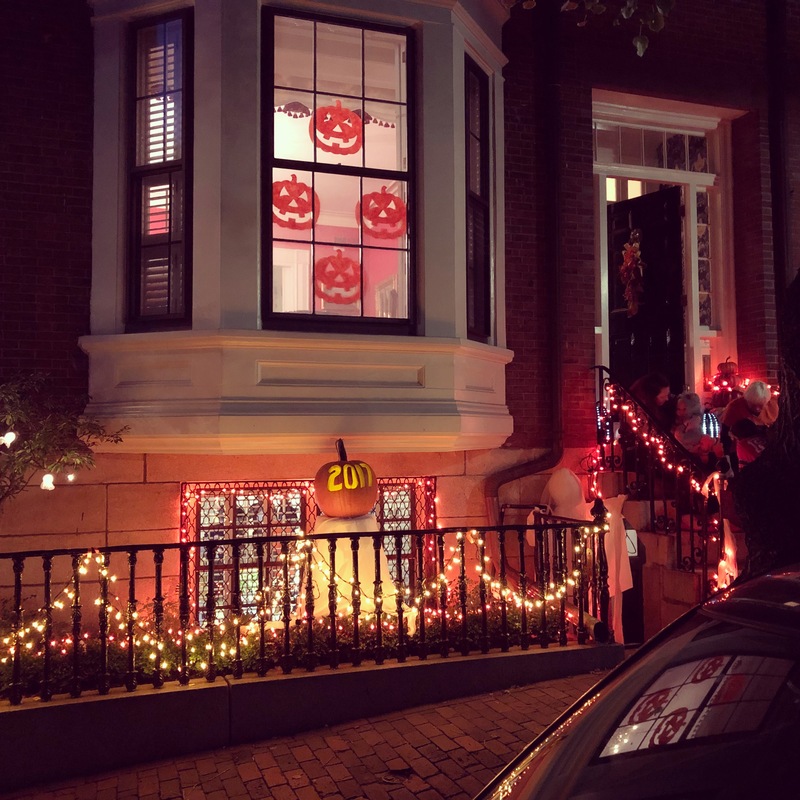 Practices/traditions such as trick-or-treating have a long history in America dating back to around the 1920s and 1930s. Of course the holiday itself is of Celtic tradition and consisted of people dressing up to defend themselves against demons. I could write an entire blog post on the history of Halloween because it is so interesting and highly contested. 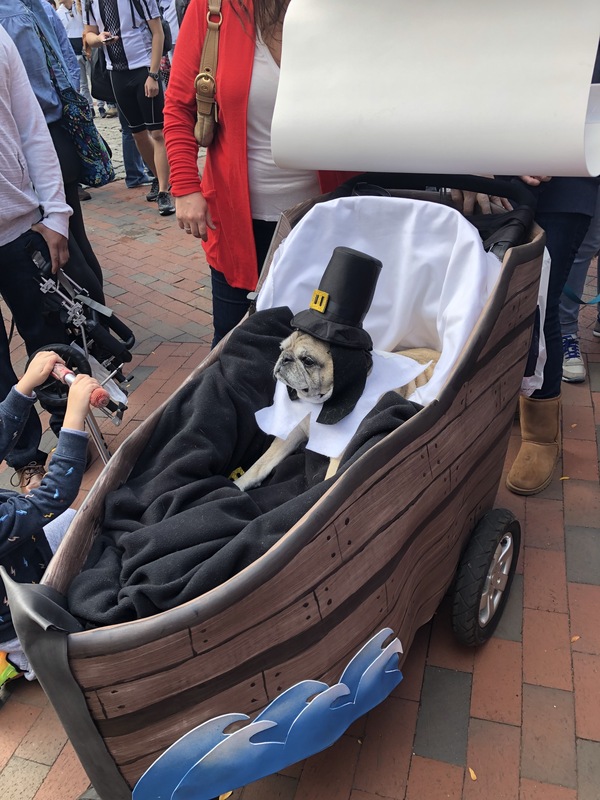 Rather, I want to focus on the experience I had today which included visiting memorials in Salem and trick-or-treating in Boston. 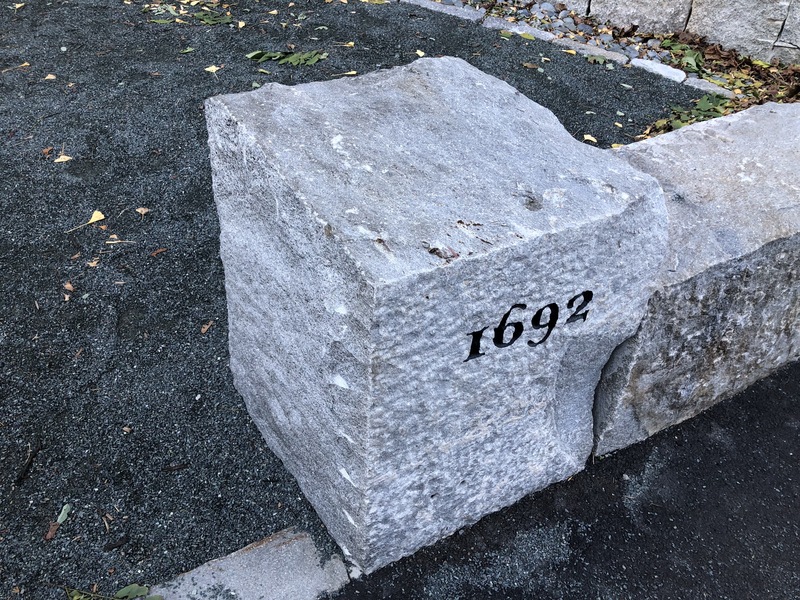 In 2015 I completed my thesis on the existing 1692 witchcraft trials memorials in Salem and Danvers. I came to the conclusion that both memorials have made a valiant attempt at memorialising the past and remembering those who were victims of the trials. Around two years later, an amazing discovery was made – the bodies of the victims. The victims were not burned at the stake, despite common belief. Instead, they were hanged with the exception of Giles Corey who was crushed. For centuries, there has been a desire to find the final resting place of the victims and, therefore, some kind of closure. There have been so many theories regarding where they were buried. Proctor’s Ledge was a promising suggestion. There were some archaeological digs and long story short the remains were found. To commemorate this discovery, the decision was made to build a memorial. The first memorial in the city centre opened in 1992. Basically, an international competition was held and a panel selected the winning entry. 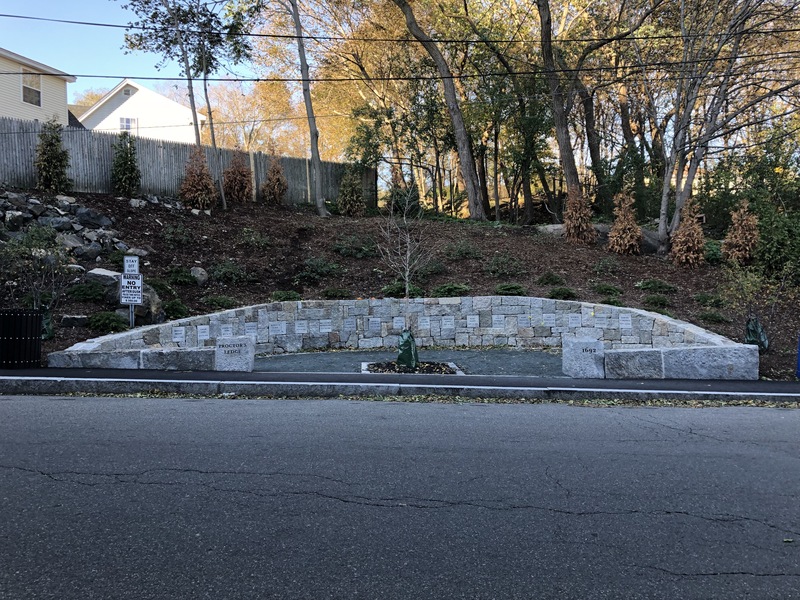 For the new memorial, the city selected a landscape architect, Martha Lyon, who consulted with the public and landholders. From this, a design was created and the memorial was built. I had seen photographs of the memorial online and initial sketches. Already, I had a very strong opinion. On seeing the actual memorial itself, these initial responses were confirmed. It is located on Pope Street, just next to the side of the road. 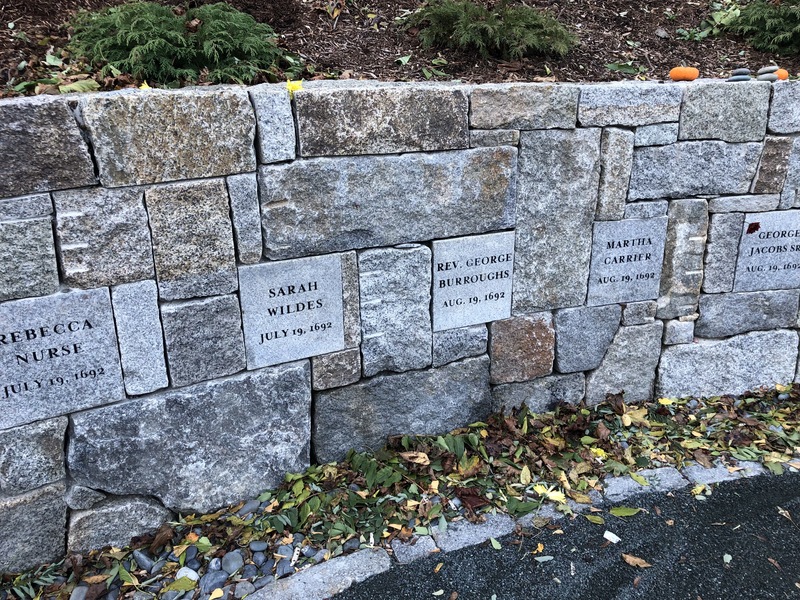 It is a semi-circle of stones with evenly-spaced plaques set into the wall each bearing the name of one victim and their date of death. 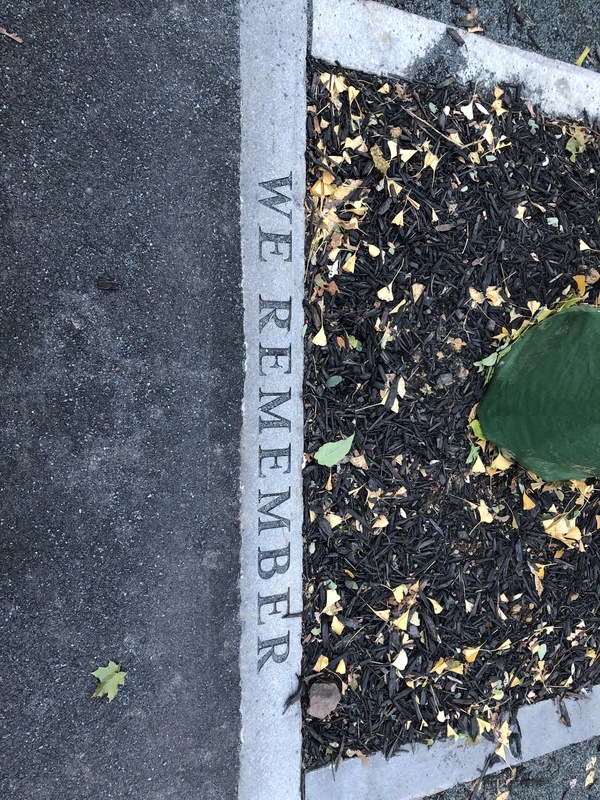 In the centre is a single oak tree with “We Remember” carved into the ground beneath it. 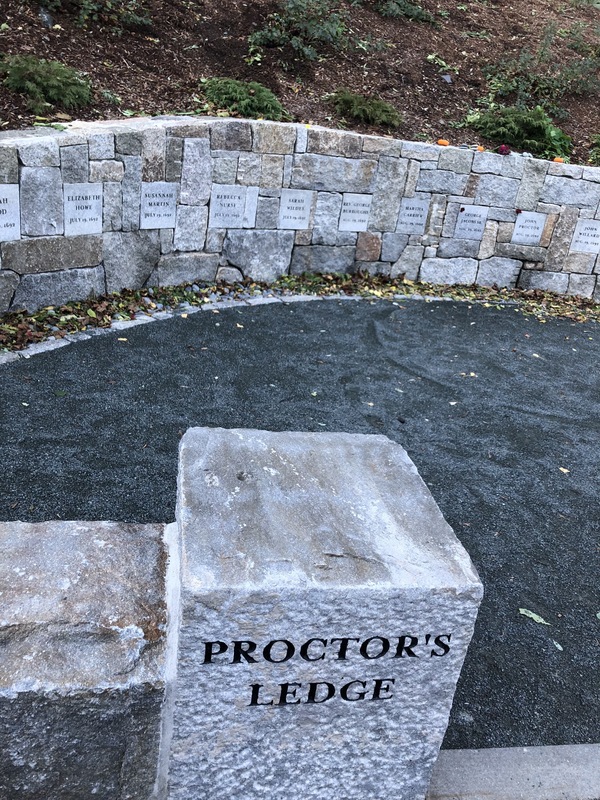 At either end of the memorial’s entrance are two large blocks with “Proctor’s Ledge” inscribed in one and “1692” inscribed in the other. I thought it would look quaint, a respectful site that blended into the environment. Instead, it looks awkward and as if it was rushed. 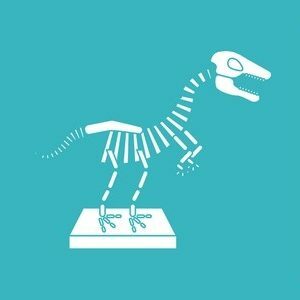 It looks incredibly similar to the other memorial in the city and I think it was a missed opportunity to develop a memorial that was unique and truly reflected the magnitude of the history and the discovery. What this may look like, I have no idea. I do know that it would not have a large and distracting “keep off the slope” sign jutting out from its edge. I am not saying that what has been produced isn’t terrible at all, just very different to what I was expecting. After spending 14 months closely reading and reflecting on the other memorials, I was probably too close to this topic to ever be objective. Memorials are very tricky things and at the end of the day, there is a memorial there marking this location and it’s place in history. There was even evidence of people interacting with the memorial which was great to see. 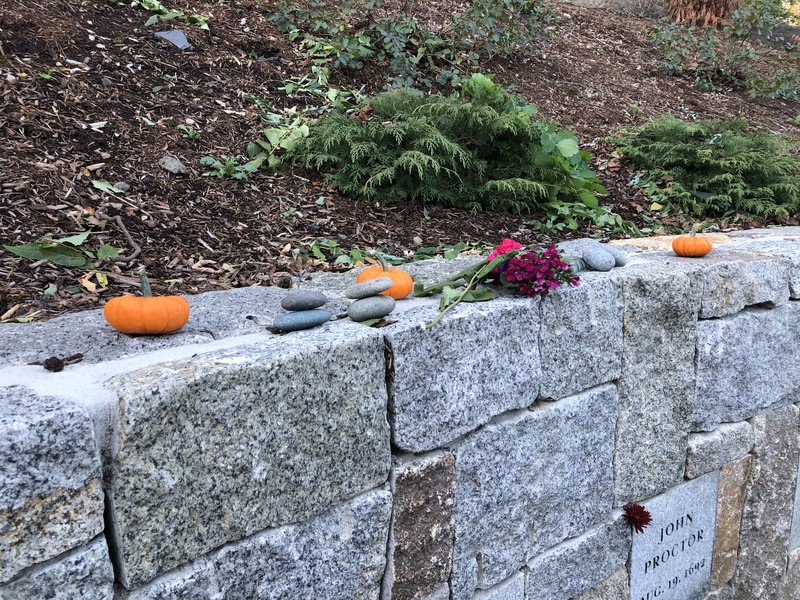 Little pumpkins and stones had been left on the top of the memorial. For these reasons alone, I am glad for the existence of this memorial. Moving on, there is this conflict happening in Salem that was highlighted today. This is between the outright horrific past and the commercialisation of this past in the present. 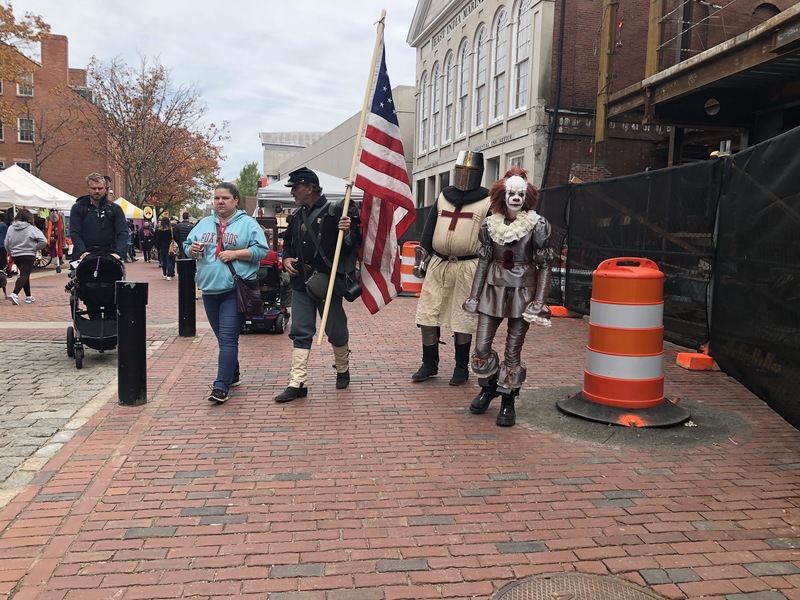 Seeing literally hundreds of people dressed up for Halloween walking the streets was both a little uncomfortable yet a tangible festival where people can and do take the opportunity to learn about the past. It’s a conflict that I would love to look into more and even formally study in the future. 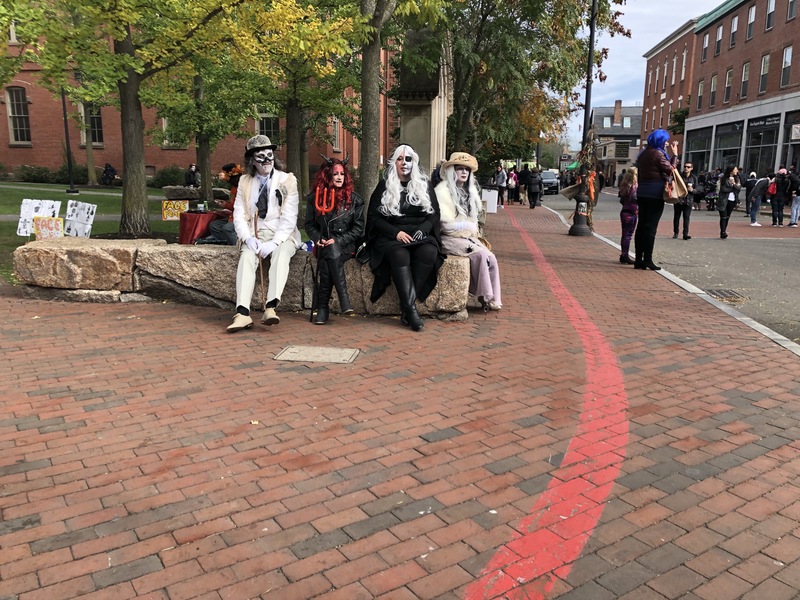 After a few hours in Salem, we were ready to leave and experience Halloween elsewhere. 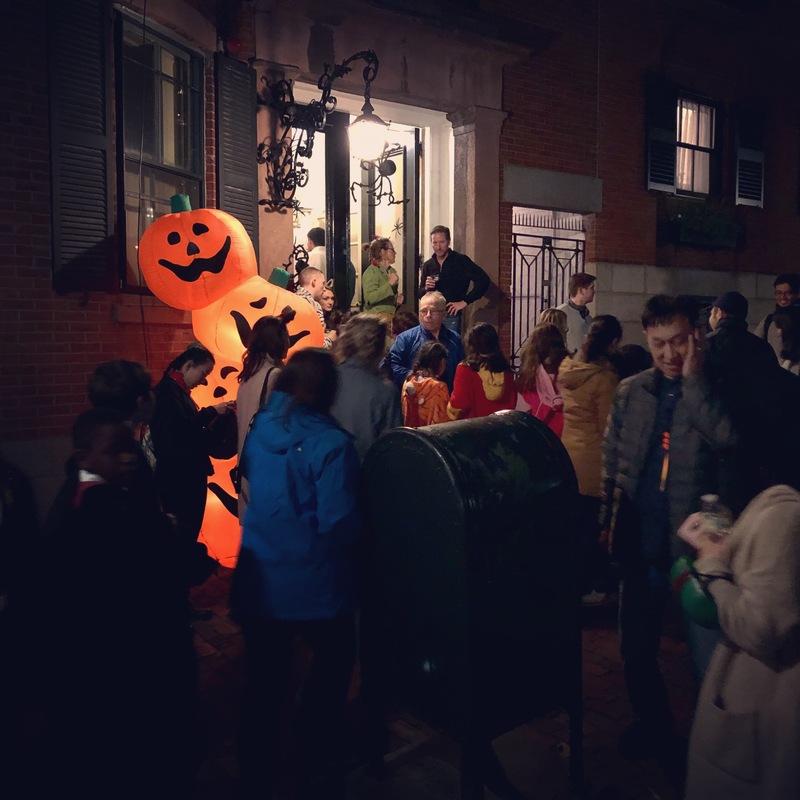 We opted to return to Boston to witness firsthand the trick-or-treat tradition. 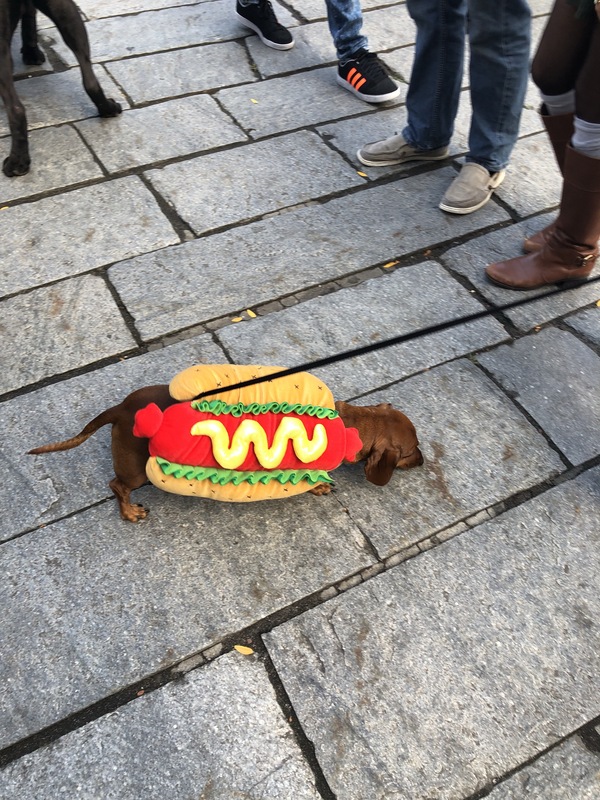 There are some streets above Boston Common, for example the famous Acorn and Chestnut Streets, that were closed to traffic from 4.30 pm to 8.30 pm. We headed out around 6 pm, very excited to see the annual trick-or-treat tradition. The streets were filled with people, yet it never felt overwhelming. 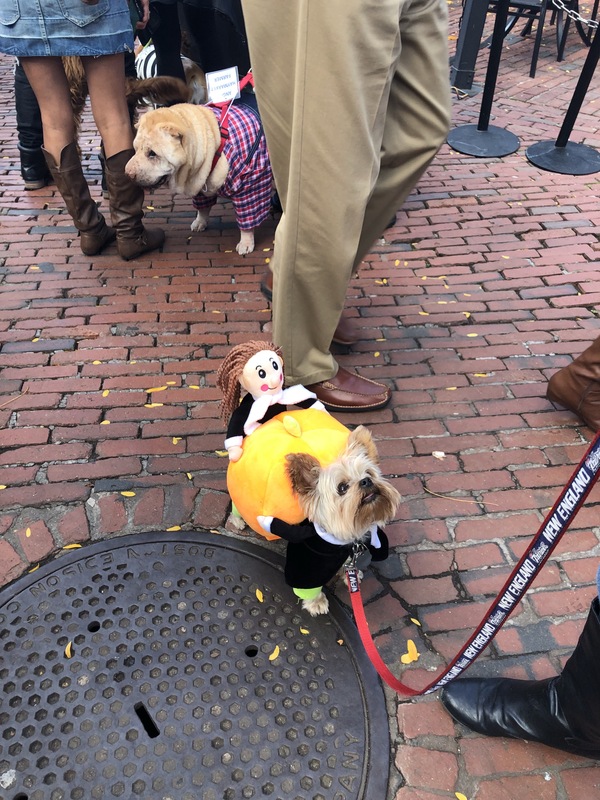 Kids were running around in such a variety of costumes eating candy with one hand and holding their trick-or-treat bags in the other. It was an incredible night. The atmosphere was unlike anything I had ever experienced before. It is one of those cultural phenomenons that you have to see to believe. We are starting to celebrate Halloween in Australia, but, of course, nothing that compares to America. 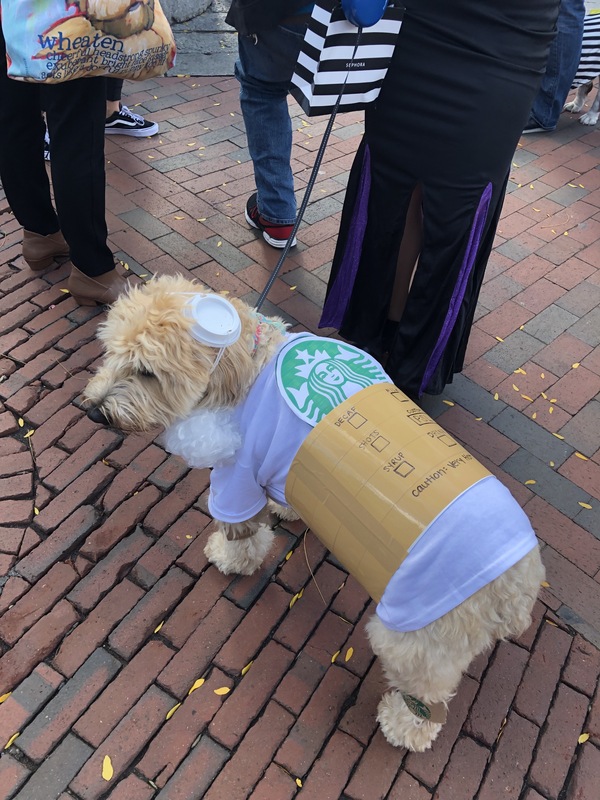 For this reason, I would and will argue that Halloween is cultural heritage. I hope everyone had a safe and happy Halloween! It is my favourite time of the year as it sort of launches this end of year joy. 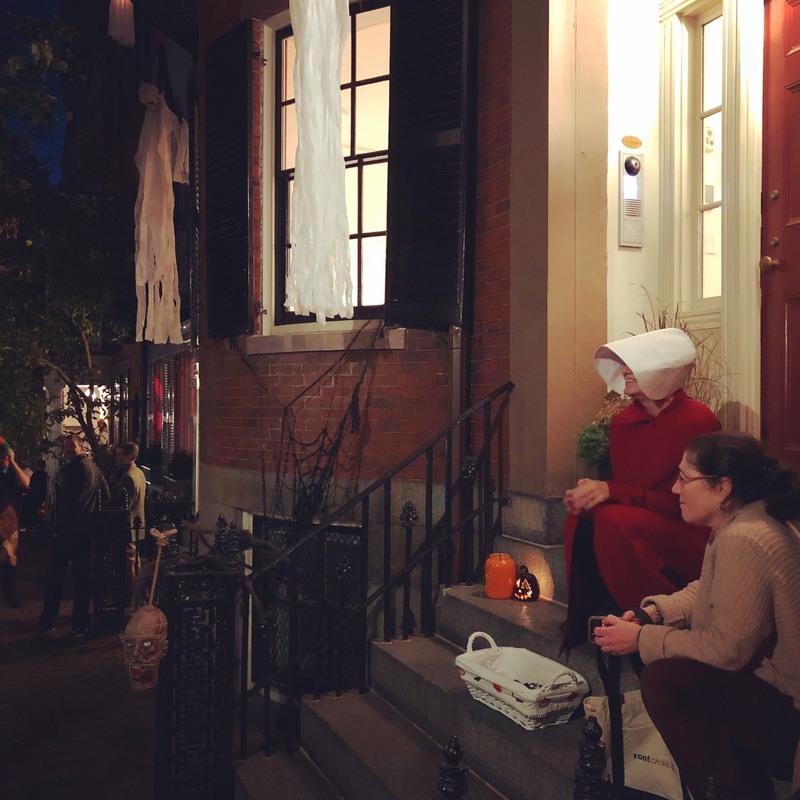 I only hope I can experience another Halloween in America. 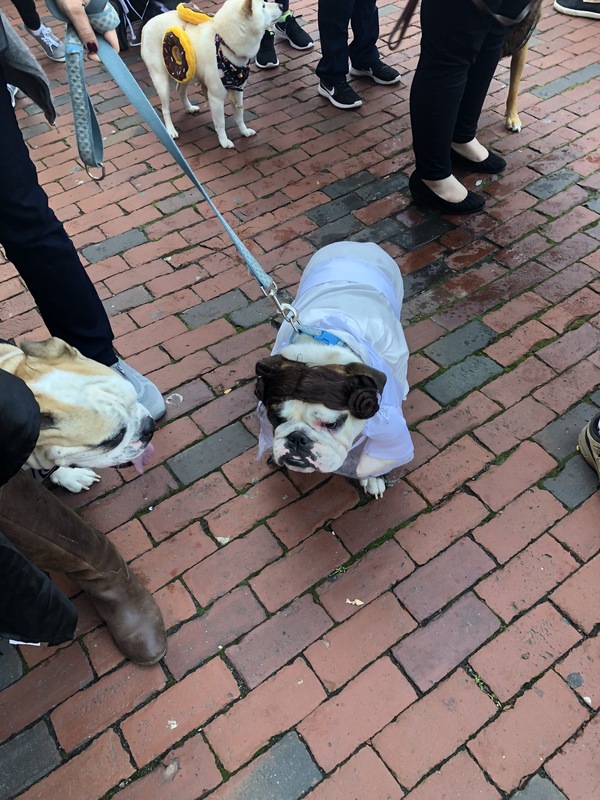 To finish the blog post, here are some cute dogs in Halloween costumes. You’re welcome.